I can't find these mentioned on the official site so they may be test items. 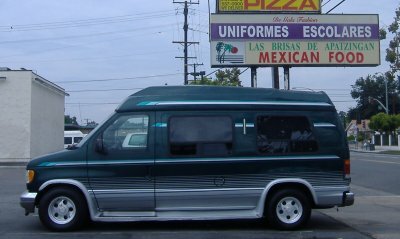 Since I'm always analyzing the traffic for this site and what it is that drives people here it is hard to not be cognizant of the fact that people are always searching for information on Naugles, the erstwhile Mexican fast food chain that enjoyed about a two decade run before being bought out by Del Taco. These searches seem to come mainly from people who know Naugles is gone and are simply waxing nostalgic, hoping to find some remembrance of Naugles on the web, but sometimes it seems that people are hoping to actually find some Naugles food again. About a month ago I learned that Del Taco still serves the Naugles "Bun Taco" but that they just don't list it on their menu (price is $2.00). Since learning about it I have tried it twice, once during a walk-in visit and once through a drive-thru and didn't have any problems ordering it either time. The bun taco is basically a hamburger with ground beef instead of a patty. It's not searched for as much as the Naugles cheese burrito is but if lots of people start ordering it then it could tip the Del Taco corporation off to the fact that people are still looking for Naugles food. Or CLICK HERE to read it all at once. 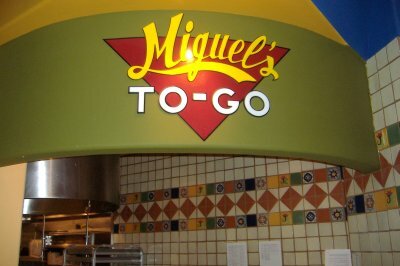 (Lake Forest, CA) Aug. 26 2008 – Who better to dream up new tacos and burritos than the employees who prepare the food? That’s what Del Taco is counting on again with the kick off of its second annual Golden Taco Recipe contest. This contest is a chance for employees to demonstrate their menu ingenuity when it comes to using ingredients already found in Del Taco kitchens. 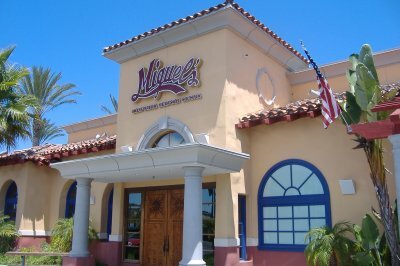 The contest was inspired by the many creative suggestions the company’s product development team received from restaurant employees. The first contest of its kind at the more than 40 year old Del Taco, this year's contest promises to be even bigger. Last year's winning recipe, an "Enchilada Cup" was among more than 120 submissions that made tasty use of ingredients already found in Del Taco restaurants. This year, employees may add an additional ingredient if they choose. Submissions are due by October 1. Winners will receive cash prizes and have their recipe considered for inclusion on the Del Taco menu. Founded in 1964, Del Taco, the Lake Forest, California-based company operates or franchisees more than 510 restaurants in 16 states. 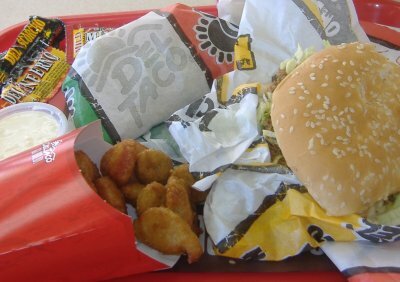 Del Taco offers a full range of made-to-order Mexican items such as tacos, burritos, quesadillas and American favorites including cooked-to-order burgers, fries and shakes. Del Taco uses fresh ingredients including hand-made salsa, fresh produce, freshly grated cheddar cheese, chicken grilled every hour and lard-free beans made from scratch. 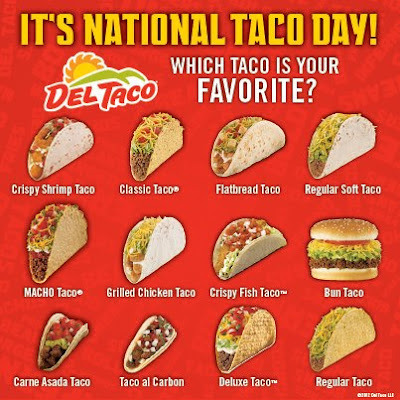 Additional information is available at www.deltaco.com. The Crispy Jalapeno Rings appear to now be available at all Del Tacos, not just test stores, for $1.99. A few days ago I went through the drive thru at the Del Taco on Brookhurst between Slater and Warner in Fountain Valley early in the morning. 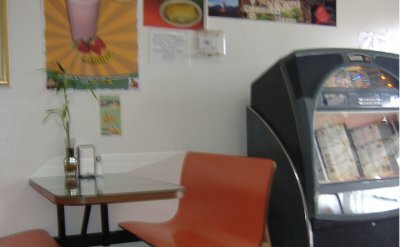 This is a location that used to be a Naugles. The guy taking my order asked if I wanted a Macho Bacon Egg Burrito with red and green sauce. I didn't see it even mentioned on the menu board but said I would try one. Now when I look back at some of the comments on my Naugles entries here it looks like this could be another hidden Naugles item on the Del Taco menu. Does anyone else have any more info on this? There's also a regular taco and spicy jack quesadilla hidden in there. Del Taco recently mentioned International Taco Day on their Facebook page and showed the Bun Taco as one of their many taco options. Notably they do not call it a Naugles item and it may be correct for them not to because it may have actually started as a Del Taco item, but the distinction may be lost to history. In my recent review of Peña's I tell of trying out their pozole verde which was recommended in a Register review. The OC Weekly's Gustavo Arellano read my report and left a comment that in effect said, "What you were supposed to get at Peña's was their cochinita pibil. 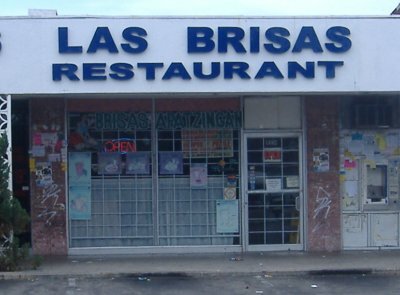 You were supposed to try the pozole verde at Las Brisas de Apatzingan." Being game for another bowl of pozole verde and finding myself near Las Brisas de Apatzingan one day I decided to compare and contrast this green pork soup from both restaurants. Gustavo states that Las Brisas de Apatzingan is "in a bad neighborhood" and that might be true but at least it's not deep in a bad neighborhood. 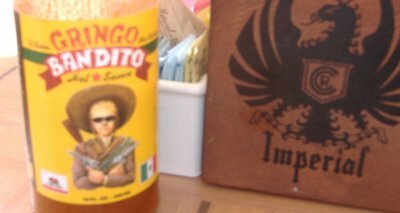 I ordered the soup and grabbed me a bottle of Squirt from Mexico. 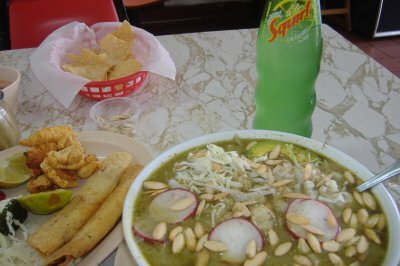 When the soup came I saw that it was very similar to that served by Peña's: almost exactly the same serving size with a plate of cabbage, onions, radishes, a lime wedge, a cheese-stuffed pepper, some chicharrones, and two potato taquitos. 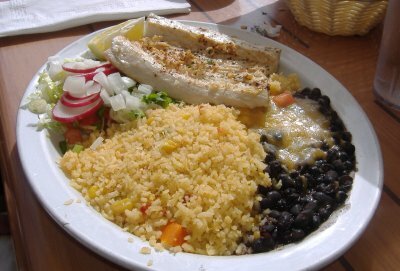 But the plate of soup condiments from Las Brisas de Apatzingan also had an avocado slice and some pepitas (pumpkin seeds). As you can see from the picture below I loaded my soup up with the pepitas but still had some left over to snack on later. Most of the other condiments went into the bowl too making this soup more like a stew that took almost forty-five minutes to consume. A minor drawback was that the chicharrones (fried pig skin) were either too chewy in parts or impossibly hard to crunch into rather than possessing the evenness of the chicharrones at Peña's. I suspect though that this was a fluke, more of an exception than the rule. Another difference I detected is that the pozole at Las Brisas de Apatzingan was not as sinus-clearing as Peña's. You can decide for yourself if that's a good thing or not. Click here to see the unedited album (6 photos) at . 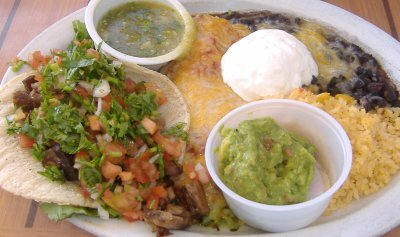 Walking the Costa Mesa beat, guest reviewer Shelly Borrell checks in with her review of El Toro Bravo on 19th St.
El Toro Bravo Tortilleria is tucked back in the corner off 19th Street in Costa Mesa, near Wallace Avenue. You'll never see it just driving by. Although I live right down the street, Christian had to tell me about it and I'm glad he did. 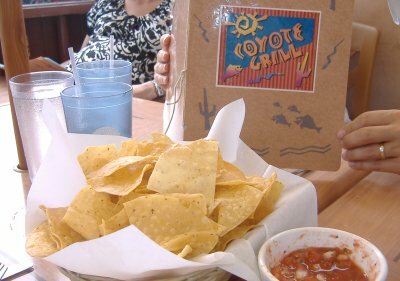 They make and sell their own chips and tortillas on the premises, which you don't see too often. The Tortilleria is set back in a small strip mall near Jugos Acapulco and Smart & Final, both of which are visible off 19th Street. Once you see those locales you'll be getting warmer. 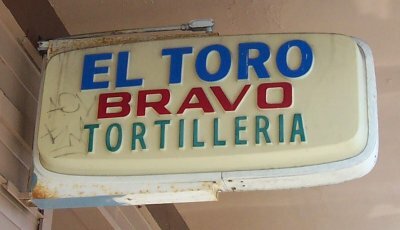 El Toro Bravo has two doors—You enter on the left, curve around, then exit on the right. The system works well. There is no dining inside. 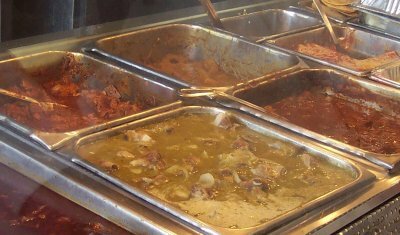 As you make your way through the line, you'll first see prepared dishes with various meats in sauces and enchiladas. 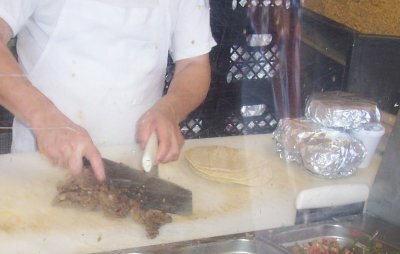 Then as you curve around to the right, you'll see the meat choices that are listed on the hanging menu, ready to be chopped up and added to a taco or sold alone to make your own. 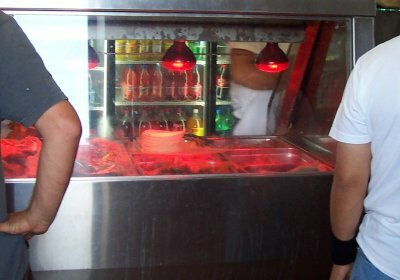 This visit I tried 3 different meats, Barbacoa (Beef), Carnitas (Pork) and Pollo Rostisado (Chicken). 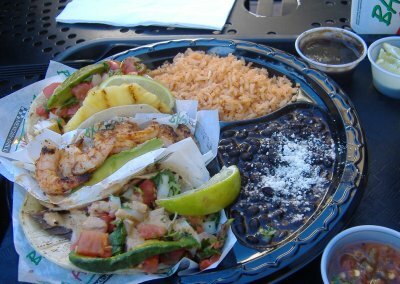 I had 3 tacos with rice and beans, which is a good way to taste a sampling of flavors. All meats were fall off the bone good, but they do just chop it up all together, so you might want to inspect your taco before diving in. I had to pull a couple cartilage pieces out of my chicken taco, but after that I enjoyed it very much. 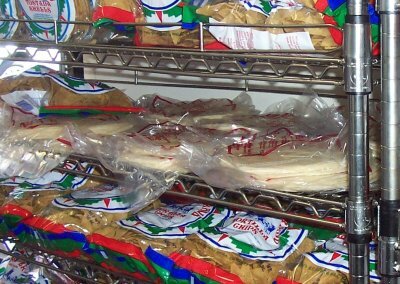 The Tortilleria goes through a lot of corn making its own tortillas, chips and tostada shells. It's fun to get a glimpse of the process while progressing through the line. I should add that the portions are very generous. My 3 taco combo must have weighed about five pounds. And those ordering the meat and fixins on the side also received a sizeable portion of all. Overall, I think it's a great place to purchase tasty cooked chunks of meat for a party. I think your guests would appreciate it. They'll also deliver or cater upon request. I'm glad it's in the neighborhood and I finally made it over there. Click here to see the unedited album (19 photos) at . Taking note of all the times that coyotes have been in the news recently and my own recent face to face encounter with one on the San Joaquin River Trail (photo taken moments after the coyote and I were face to face) it seemed apropos that I'd meet up with a group of friends at Coyote Grill in Laguna Beach for some summertime dining and socializing. I've been trying to cut down on dessert recently but when I see a unique item on a Mexican menu I usually get it. 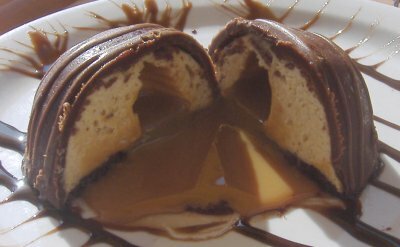 Fortunately others in the group helped me finish off this very rich dulce de leche dome: "A dark chocolate dome encases a caramel mousse, an oozing core of caramel, and a chocolate spongecake bottom." 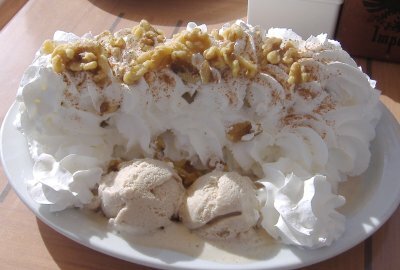 But that dessert was nothing compared to the leviathan that was brought out next, the Banana Chimichanga: "Sliced banana in a fried flour tortilla, sprinkled with walnuts, cinnamon, and topped with whipped cream. You'll need help with this one. Maybe served with ice cream." While I was situated so that my back was turned to our waiter as he came walking up with this dish I began to hear gasps from those in my party who were on the opposite side of the table and whose field of vision became more and more obstructed as the gargantuan dessert approached. I admire that the menu states very honestly and forthrightly that this item is "Maybe served with ice cream." Apparently we ordered the Banana Chimichanga when it did come with ice cream. Due to the walnut content I couldn't have any but the rest of my group sure enjoyed it. 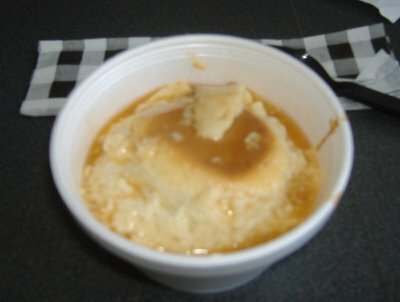 I was told by one of the owners that Coyote Grill is not known for its desserts but I think they definitely have a number of unique dessert items worth checking out. Click here to see the unedited album (20 photos) at . IMPORTANT NOTE: Read whole entry for all pertinent info. Stopped by Taco Bell earlier today for a quick cheap meal. I'd seen ads about their new "melts" lately so I thought I'd finally try one of those (they are like a burrito with more cheese and no beans) but also saw that, at least at the location on Barranca in Irvine, that they also have new fajita tacos, fajita burritos, and fajita platters as well as a "Volcano Menu," with a Volcano Double Beef Burrito, a Volcano Taco (in a red corn shell), and a Volcano Crunchwrap (with or without chicken). 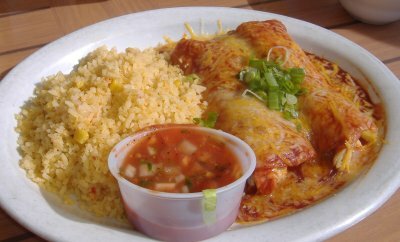 As of today their official site does not mention the fajita items or the Volcano items, but doing some exploring on the Internet I found that the Volcano Burrito has been on their menu before. Some guy even made some fake ads for it and the Wikipedia entry on Taco Bell mentions that the Volcano Burrito appeared as "a special promotion in conjunction with the 1995 film Congo ." I should add that people seem to be searching for this "Volcano Menu" stuff more and more so maybe it's making its way out of the test markets. More information at the Fast Food Maven blog and at Nibbles of Tidbits. 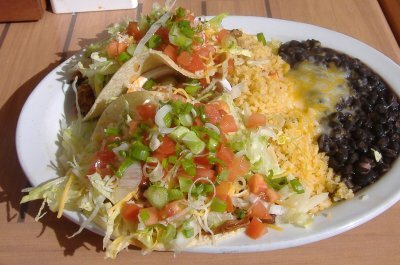 If you try a Volcano Taco leave a comment here with your thoughts on it. 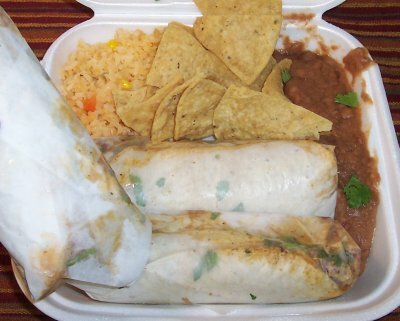 UPDATE: As of April 20, 2009, the Volcano Burrito is still available at the Irvine store on Barranca. UPDATE (May 14, 2009): Wow, people have really been searching a lot on "volcano double beef burrito." 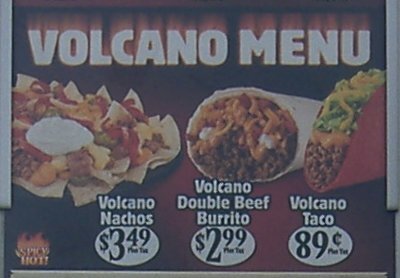 Turns out that the Volcano Menu has spread now to pretty much every Taco Bell and there's also a Volcano Big Box meal. It even has its own Official Site. 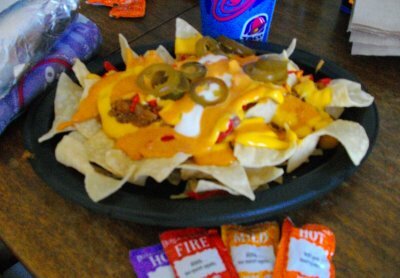 UPDATE (June 8, 2009): Word on the blogosphere is that a new Volcano Menu item is coming to Taco Bell in August. UPDATE (July 30, 2009): The Volcano Nachos are now being mentioned on the Volcano Menu website, so they are probably at all Taco Bells now. UPDATE (August 6, 2009): Just got some Volcano Nachos myself and the cost was $3.49. If anybody sees them for a different price elsewhere leave a comment here. So I turned around to the takeout counter and began perusing the menu. Scanning quickly for something unique I spotted the "Mole De Maria" and ordered that and a soda. The employee at the takeout counter asked if I wanted my entree with corn or flour tortillas. Trying to lean the more authentic way I requested corn. I asked why and was told that Miguel's corn tortillas are store bought but that the flour tortillas are made on the premises so I switched to flour and then found out that not only are the flour tortillas made on site but they are made when you place your order. How's that for service? I was then brought my soda and was told that if I drank it before my food came I could get it refilled. Now that was something I was wondering about but the fact that they brought it up without me asking earns them some bonus points (and I did utilize the refill). 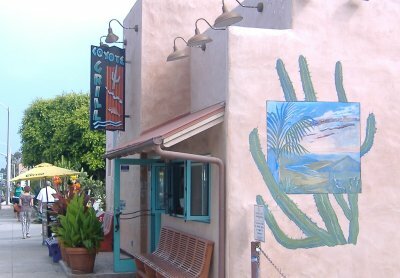 The worker at the takeout had heard me asking the hostess how long this restaurant had been here and while she didn't know the answer right off the bat he answered that they had been there for about four years now in the spot formerly occupied by Tortilla Beach. 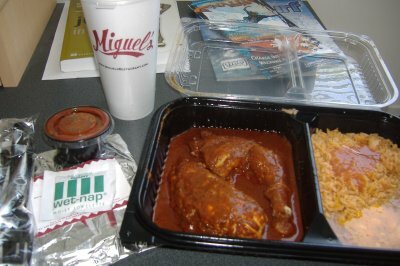 He also explained that they are part of the same chain as Miguel's Jr. in Corona which we reviewed quite some time ago (one of our few out-of-county reviews). Back at work now I opened up the spread and found some moist, tender, falling-off-the-bone chicken in a full-bodied mole sauce (the menu mentions it contains peanuts as one of its 24 ingredients—so be warned in case you have a peanut allergy). The pinto beans and Spanish rice were sincere if not stupendous and made great filling for the three chicken mole tacos I assembled for myself.